Conserve the best from nature: The handy QuickConserver juice pasteurizer reliably and effectively pasteurizes both clear and naturally cloudy fruit and vegetable juices. Preserve your juices and enjoy the fresh, unfermented taste of nature even longer! Freshly squeezed fruit and vegetable juices have a high vitamin content and an extra portion of dietary fiber. The QuickConserver ensures that the valuable ingredients and the good taste are retained for a long time through a pasteurization process that is gentle on the aroma. The practical juice pasteurizer is easy to use, automatically pasteurizes your juices at the push of a button, and then fills them – preserving juice in no time! Thanks to its compact, space-saving design and simple operation, the QuickConserver is suitable for both commercial juice production and private households. The juice pasteurizer delivers the best juice quality and can pasteurize 2 to 3 liters of juice per minute. The automatic cleaning makes your work even easier and guarantees the best hygiene. Time-saving and efficient: The QuickConserver fills the juice directly after pasteurization either in bottles or in bag-in-box packaging. 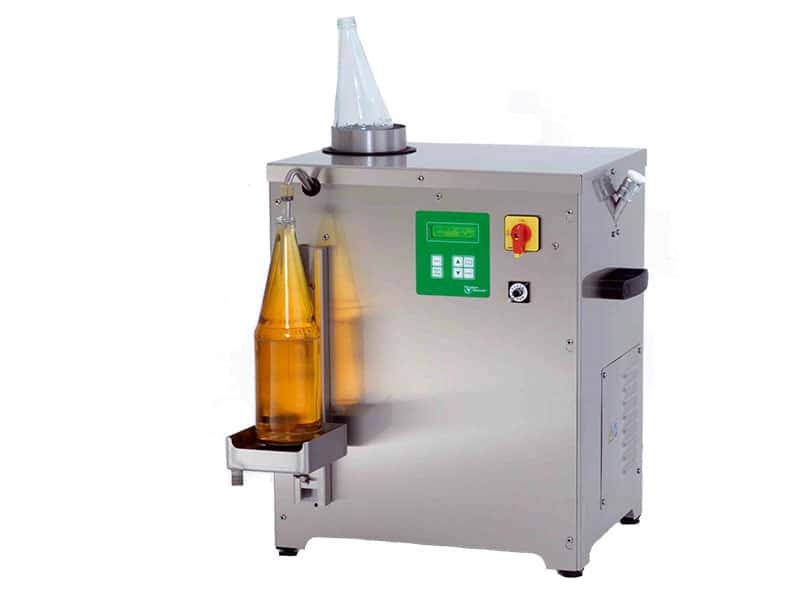 The integrated bottle preheater protects the bottles from bursting, and the filling level sensor automatically stops filling as soon as the bottle is full. The practical portion counter provides the best control over the bottles already filled. Pasteurizing juice and filling has never been so convenient! You want maximum shelf life? The bags of the bag-in-box packaging form an optimal oxygen barrier and guarantee an even longer shelf life of the juices with the best oxidation protection. Of course, you can also use the QuickConserver to fill liquids without pasteurizing them first. Would you like some more mulled wine? The smart juice pasteurizer has something to offer even in the cold season: With the QuickConserver you can easily heat mulled wine and fill it in portions! Pasteurize your juice gently and safely with QuickConserver.